Timer (pulses in minutes) software for the printer and parallel port. Software for the printer and parallel port with pulses in minutes. TIMER (pulses in minutes), consists of 11 forms. A main form, 8 output forms, 1 inputs form and a settings form. The main form gives the status of all 8 outputs and 5 inputs. The location of each output and input can be altered on this form. Each output form can be selected by the push-buttons marked 1 to 8 or the inputs can be selected by the push-button Inputs. All outputs have an additional pulse timer from 1 second to 24 hours (set in minutes), on or off. The pulse will work regardless of the mode the form is in, ON, OFF or AUTO. The Inputs form can have up to 5 inputs. Inputs 1 and 2 can turn on or off outputs, if outputs are in AUTO mode. Input 3 can turn on or off outputs for a set time, if the outputs are in AUTO mode. Inputs 4 and 5 can play a selected sound (.wave file) in windows\media and c:\timer. 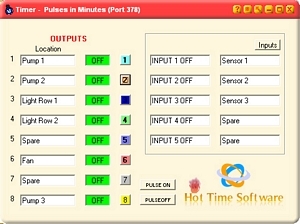 Same as Timer program with additional pulse timer in minutes on each output form. Has also Master control on Main form. Access to port 378 or LPT1 only. Can be used on any computer that has WIN 2000, NT, XP and Vista 32 bit, WIN 7, 8 and 10.